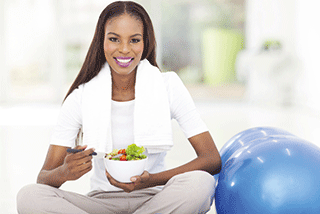 Personal trainer and wellness coach, Ashley Hunt, has devised the following fitness plan for Your Healthy Living readers. These exercises can be done anywhere: you just need a step or a bench. Loosen up with some dynamic stretching. Perform the following movements. Neck rolls – Gently roll your neck around, clockwise, for three rotations, then anticlockwise for another three. Arm circles – With your arms out straight, make large clockwise circles, moving through your shoulders’ full range of motion. After 10 circles, swap direction for another 10. Leg swings – Holding on to a bench to stabilise your body, balance on your inside leg as you swing the outside leg forwards and back. Repeat 15 times then swap to the other side. Hip circles – Still holding on to the bench, lift the outside leg, bringing the knee up in front of you. Then rotate the hip to take the knee to the side and create a circle. Repeat 10 times on each side. Walkouts – Start from standing and bend forward and reach for the ground. Then walk your hands out in front of you until you come to a high plank position. Your elbows should be directly under your shoulders and your wrists in line with your elbows. Walk your hands back and return to standing. Repeat 10 times. Low lunge and reach – Step your right leg forward and lunge, keeping the back leg as straight as possible. Bring the hips low and lift your left arm up and over to the right. Feel the stretch all the way from the hip flexor, at the front of your hip, to the side of your torso. Return to standing and alternate. Repeat 10 times on each side. Complete each of the following exercises for 45 seconds, then rest for 15 seconds. Squats – Start with your feet hip width apart, toes pointed out slightly. Hinge at the hips as you bend your knees and lower down so that your calves touch the back of your thighs. Push through your heels as you return to standing. Make sure your knees follow your toes and don’t come in towards each other as you lower. Keep your heels on the ground the whole time. Lunges with back foot raised – Position your back foot on a bench and walk your front foot about two steps out in front of you. Keeping your chest up, bend the front leg, bringing the back knee close to the ground. Push through the front heel as you straighten the front leg. Downward dog push ups – From a high plank position, lift your hips high as you push your head through your arms and bring your heels to touch the ground (keep your knees bent). Bend your arms as you lower your head to the ground, then straighten the arms and return to the starting position. High plank to low plank – Start in a low plank position with your forearms on the ground and a straight line from your shoulders to your ankles. Press your right hand into the ground and straighten, followed by your left hand as you come into a high plank. Lower yourself down again and repeat. Hip raises – Lie on your back and lift your legs up straight to form a 90-degree angle. Place your arms by your side and push into the ground as you raise your hips off the ground. Lower down and repeat. Rest for 30 seconds, then repeat the circuit three times. Chris Hall, founder of Hall Training Systems (www.personaltraineroxford.com) offers some tips to get your nutrition in line with your fitness goals. People often lack sufficient fluid intake, which is important. It’s a good idea to drink water when losing weight because it can help the liver metabolise body fat more efficiently. One study showed that subjects who drank half a litre of water 30 minutes before meals had a 44 per cent greater weight reduction over 12 weeks than those in the non-water drinking group. A higher protein intake helps with weight loss, supports and preserves lean muscle tissue, increases satiety (feeling full) and aids hormone development. To help increase your protein intake, try adding at least one serving of these foods to each meal. Each serving contains 20g of protein. For people looking to get lean quickly, I often recommend a two-week period of low carbs, with around 20 per cent of their total daily calorie intake coming from carbohydrates. This means consuming only 50-70g of carbs per day. A lower carb intake encourages you to eat more protein, which will help with the above – bonus! Then they can slowly begin to reintroduce carbs back into their diet week-by-week to assess their body’s carbohydrate tolerance. If fat comes back on quickly then they need to keep their carbs low. Some people can tolerate carbs better than others, so it’s important to work out what works best for you. Each serving will provide 20g of carbs and is high in fibre. The 20g increments make it easy to gradually increase a person’s carbohydrate intake and to assess where their ‘carb ceiling’ is. Laura Williams, a fitness expert and ambassador for Solgar (www.solgar.co.uk)), offers some advice on how to realign your fitness goals and achievements to give you a more effective set of results.